Man's Best Friend...or Wing Man? While that unmistakable wet dog scent may not scream romance, did you know having a dog can actually help you get a date? Research shows people with pets (more specifically human’s best friends) are more likely to meet a significant other. So, in the spirit of the season of love, you may want to treat Fido to something a little extra special this Valentine’s Day. Dogs owners have a dating advantage because when you have a pup, who drags you out of the house daily, you’re more likely to be in positions and places where you can meet people. 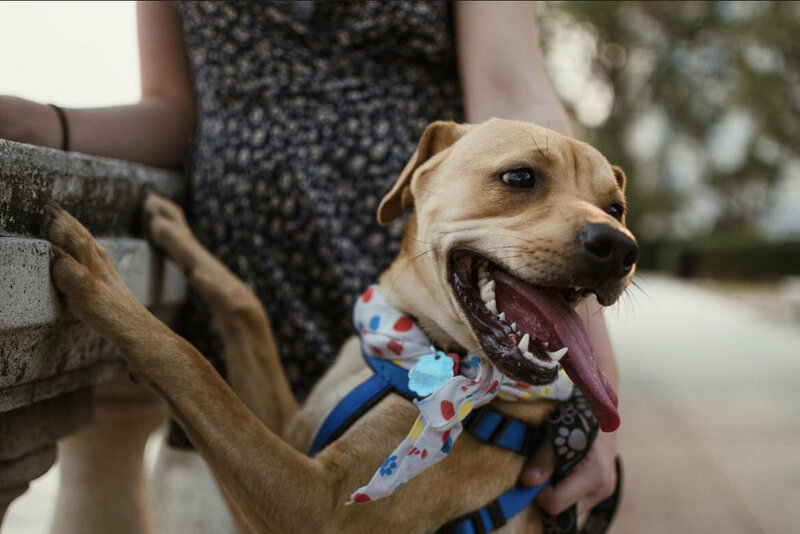 Whether you take Bingo to a dog park or you go for a walk downtown, literally “getting out there” more often will lead to an increased likelihood in meet cutes with…well, cuties. More importantly, what’s a better icebreaker than a furry, barking ball of love? Apparently, not many things. It’s been proven that people are more likely to approach you when you’re walking a dog. Why? Because they have an excuse to do so – duh! Instead of an awkward (and totally random), “Hi; how are you?” you’ve already given that cute stranger the perfect puppy excuse to approach you. And, if you both have dogs, you already have something in common! People who like animals tend to be more adventurous, compassionate and social creatures (pun intended), so if you take a chance (or a walk), you may find your perfect match at the end of a leash. 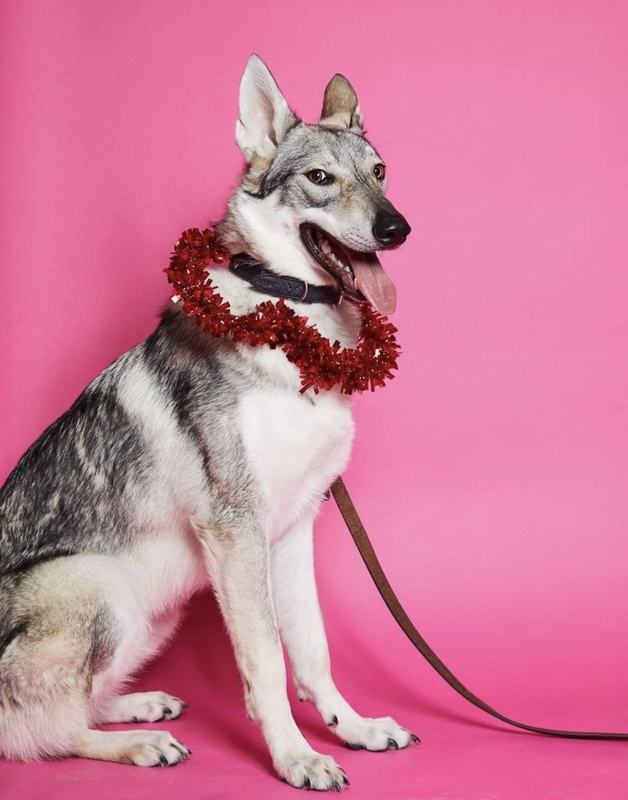 Even if this Valentine’s Day, your furry friend doesn’t secure you the sweetheart of your dreams, you can still enjoy going for a stroll and sharing in some human and doggie treats. Enjoy your day together and don’t forget to go for a walk – you never know who could be just around the collar! If you’re adopting a new puppy, you are probably looking forward to all the fun, the kisses, and the snuggles. You’re looking forward to watching her grow from an adorable little puppy to a loving, well-rounded, healthy adult dog. As you know, puppies don’t stay little forever. Puppies grow extremely fast. And part of what’s expected of you is understanding the nutritional requirements for your growing pup. How often should you feed your puppy? What should you feed her? Let’s find out. As a general recommendation, puppies who are six to twelve-weeks-old should eat four meals (the same amount each time) during the day. Try to stick as close to the same time every day, too. Your puppy should be eating puppy food only. Food specifically designed for puppies are made to fit the nutrition requirements for a growing pup. If you want to make their meals yourself, you should first discuss the decision with your veterinarian. Your vet can help you design a meal plan that fits your individual puppy’s needs. Once your pup hits three months old, you can eliminate one feeding period. You will now only have to feed her three times per day instead of four. Breakfast, lunch, and dinner. Simple, right? And again, it’s recommended she eats the same time each day and each meal is proportional to the other. Your puppy is starting not to look like a puppy anymore at this stage in their life. Once your pup hits six months of age, you can drop another food period. You’ll now be feeding her two times per day instead of three. When Can I Transition to Adult Food? This is a hard question to answer because it truly depends on your individual dog. But, as a general guideline, dogs who are small-breed can switch to adult dog food between seven and nine months of age. Dogs who are on the larger side shouldn’t be taken off puppy food until they’re at least one year old. Once your dog hits one-year-old, you can stay feeding him twice per day at the same time each day. How Much Food is Too Much? Here’s another question that’s hard to answer. This also depends on your individual, unique dog. You can start by taking a look at the feeding guidelines on the food package. Remember, this is only a general guideline. It’s your responsibility to make sure she isn’t eating too much or too little. The best way to determine how much your pup should eat is via observation. If you see she’s getting heavier (and not in a good way), you may want to control her portions a bit more. If she leaves food in the dish, you’ll see how much food she eats at each meal. To prevent early obesity, consideration should be provided regarding how many treats she eats per day. Treats should never be more than 10% of their total diet. Yes, that includes our food scraps too. If you have any questions at all regarding her nutrition, contact your veterinarian and ask for an appointment to discuss her diet. You adopted a puppy. Both you and your puppy are so excited it’s hard to contain the happiness you’re feeling. And, you’re so proud to have a new addition to your family. But, you’re exhausted. Your puppy isn’t sleeping through the night. She’s staying up barking, getting into trouble, and absolutely hates not sleeping right next to you. If you play with your puppy during the day, he’s much more likely to sleep through the night. They’re tired out. They want to go to sleep just as much as you do. Even if your pup is too young to go for walks (due to not having all her vaccinations yet), it’s still important to make sure she gets enough mental and physical stimulation. All of these can help tremendously. Puppies can’t ‘hold it’ for long periods of time. Their little bladders don’t have enough control to prevent an accident if they aren’t taken out regularly. Your pup could wake you up shortly after you fall asleep because they’re dire to go outside to do their business. To prevent this from happening, be sure to take her out right before bedtime. By taking this simple step, you have just bought yourself more sleep time. This might sound like a ‘given’ but you would be surprised at how much we do around the house once we realize its time for bed. If you have kids, you’re probably getting everything ready for school the next day. This also may be the time you sip your cup of tea. Or, have some quiet time to yourself to calm down from your busy day. Before you pick up your new puppy, look around your home for the best place to allow her to sleep. Prepare your puppy’s bed in advance. Make sure she won’t be interrupted by any action in the house if possible. If you decide on crate training, your puppy will need a middle-of-the-night potty break. Puppies can’t hold their bladder for more than a few hours. It’s not their fault, their bodies are just not made to hold it yet. As dog lovers, we want to do as much as possible to ensure our dog is happy, healthy, and well-cared for. We want to maintain their health, but we often forget about one facet of health. Dental health. Don’t beat yourself up if you have never thought about your dog’s dental health. There are many dog lovers who do forget. Dogs can have similar issues to ours when it comes to their teeth and gums. If we don’t see the dentist in a while, some of us will start to notice our dental health deteriorating. If we don’t brush our teeth, our teeth feel ‘yucky’ and I don’t know about you… but if I forget to brush my teeth I am in a panic and need to rush to find a toothbrush. Knowing more about your dog’s dental health will help you understand how to better care for your furry best friend. We have compiled just a few facts for you. But, we recommend you dig a little deeper after reading this article to learn more yourself. Gum disease is extremely common in dogs. You wouldn’t think so… but wow. Researchers have found most dogs show signs of gum disease as early as three years old. Signs of gum disease in dogs include bad breath, yellow or brown buildup in their mouth (tartar), and irritated gums. Examine your dog’s mouth on a regular basis to check for these signs. When you go to your annual check-up at the veterinarian, you can request they take a look at your dog’s teeth, too. Have you ever had a root canal? Or, knew someone who had it done? Dogs need root canals sometimes too. Most people think root canals are only for humans, but this is just not the case. It’s more common than you think for dogs to break teeth. If your dog needs a root canal, don’t panic about the cost. It usually costs about the same as our own root canals. And, you can investigate payment plans like CareCredit offers. To help avoid the need for a root canal, be sure to monitor what your dog is chewing on. Hard objects like rocks (yes, many dogs do chew on rocks), wood, and hard toys can be hazardous to your dog’s dental health. Providing your dog with ‘soft’ objects can help significantly. We don’t mean soft as in toys they can shred apart in two seconds. But, beware of objects you know are just much too rough for their mouth. Wait. Periodontal disease in dogs is a thing? Yes, this is relatively common in dogs, too. Smaller breeds are at a higher risk than larger breeds because their teeth are actually a bit too big for their little mouths. There are signs you can look out for here too. Yellow teeth. Brown teeth. Loose teeth. Missing teeth. Smelly, yucky breath. Swollen gums. Loss of appetite. Weight loss. To prevent periodontal disease, you should brush your dog’s teeth regularly. Of course if you have an adult dog who has never had his teeth brushed, this can be quite the process. Be sure to introduce the toothbrush slow to your dog or puppy. And, be patient. You should also request dental cleanings from your veterinarian on an annual basis to keep up on your dog’s dental health. Tooth infections are horrrrrible. Have you ever had one? If not, you are one of the lucky ones. Tooth infections can cause all sorts of pain for us… headaches, nausea, and just plain out feeling awful. If your dog’s 4th premolar is infected (this is more commonly infected than the others), you will notice swelling under their eye. The reason the 4th premolar is a concern is because this tooth is larger than the others. You might also know this tooth as the carnassial tooth. Our dogs don’t feel well when they have tooth infections either. Keep those teeth clean. P.S.- Only use the toothbrushes and toothpaste that are specifically designed for our dogs. They can’t use our toothpaste… they need their own. Just as your dental health is an important aspect of your overall health, your dog’s is too. We want them to feel as good as possible. We want them to live long, healthy lives. Ensuring they have good dental health plays a huge role in their well-being. Regular checkups and consulting with your veterinarian on recommended toys, treats, and food will keep your furry friend healthy and happy. 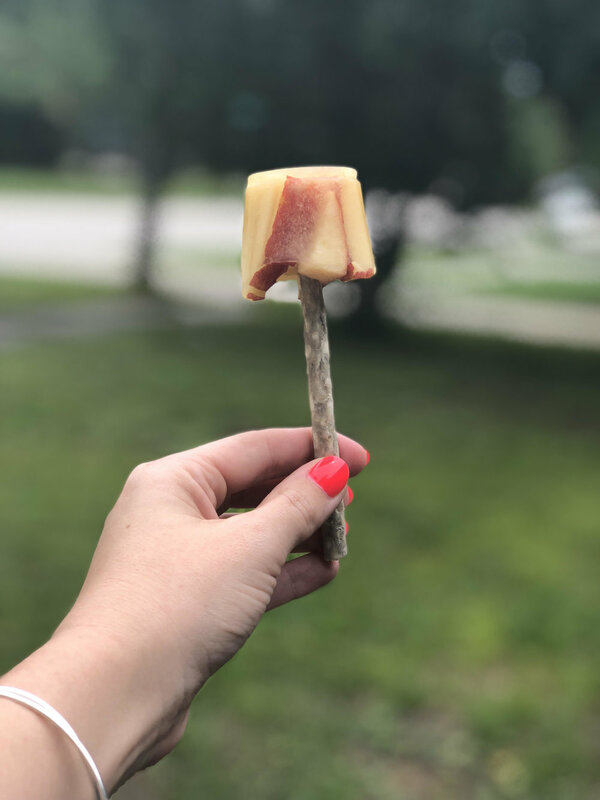 Within the past few weeks I have found that I have come across a number of articles/blogs with titles along the lines of “I didn’t know this common household item would be harmful to my dog”. And out of the articles I have read- I didn’t know these items were damaging either, I even personally own some of the things on the list. Here are a few of the findings that I didn’t know were potentially harmful to my dogs. - Essential oils – essentials oils are a new trend in the holistic wellness community. They are known for their variety of benefits as well as the many ways it can be used i.e. absorbed through the skin, water soluble, ingested, diffused into air/water vapor etc. While these are currently some of the most “natural” holistic remedies on the market- some are still harmful to dogs. For example Tea Tree Oil can be absorbed orally or through the skin. While .1% of tea tree oil is tolerated and safe for pets, larger increments can cause visual skin irritation and rashes as well as other ailments or illnesses… and this is one of the most commonly used essential oils in homes today. You can put a few drops of Tea Tree oil in your diffuser every day and be unknowingly poisoning your pet. - Xylitol – a common substitute for sugar and other sweeteners. Xylitol can cause low blood sugar inducing seizures, liver failure, or even death in dogs. Other miscellaneous items that may contain Xylitol gum, toothpaste, mouth wash, lotions and deodorants. Even foods stating “sugar-free” can still contain Xylitol. - Tulips – Tomatoes, lilies, tulips and other plants and flowers are considered to be in the Nightshade family, and can be toxic to dogs. Remember this the next time your significant other surprises you with a just because bouquet! - Heavy Metals – It should probably go without saying that heavy metals aren’t the best chew toy for a dog. But when you break it down to paint chips from an old piece of furniture or pennies forgotten in the couch cushions, it seems much more plausible, right? These metals contain toxic variables such as led. - Fabric Softener Sheets – Yes we all love that fresh + clean new sheet smell – but certain fragrant chemicals within fabric softeners can be harmful when directly put into contact with your dog. Here are some dog safe laundry brands for those of you who aren’t willing to compromise those sweet smelling sheets! Much like with humans, there is no “right” way to exercise when it comes to your dog. There are a number of variables to consider like your dogs breed and size (snout and other factors that affect the breathing), weight (you don’t want to over exert), personality (some dogs are just lazy, happens’), and build (leg size/muscle mass). Here are some of the best types of exercises based on some of these factors. Large breed (in height and girth) | I.e. Great Danes, Bernese, Greyhounds – Brisk Walks for about 20-30 minutes or less a day. Long walks or hikes can be hard on their joints. Large breed (standard snout)| I.e. Pointers, Ridgebacks – Running will help these dogs stay in shape. These breeds can endure up to 3 miles after their first year. Large breed (short snout) | I.e. Mastiffs, Boxers, and Chows - Brisk Walks for about 20-30 minutes a day. These quick and untimely walks will help these types of dogs avoid overheating and over-exerting. Small breed (short legs, long backs) I.e. Basset hounds, Dachshunds – Short brisk walks, try to avoid jumping or playing fetch. Small breed (standard snout) | I.e. Chihuahuas, Yorkie’s – These dogs are known sniffing machines! Hide their treat or favorite toy and let them hunt for it. Small breed (short snout) | I.e. Pugs, Bulldogs, Terriers, Shih Tzus – Create an obstacle course or a small obtainable goal that requires movement. Have them jump over a roll of paper towels to win a treat! There are other aspects to be considered when exercising aside from just weight loss/maintenance. Here are a few more reasons why pet-exercise is so important. Plus, summer brings so many more opportunities! Many of you likely cringe at the thought of crate training. And, it’s not because you are against crate training, but because you just aren’t sure how to get started. Or, maybe you just don’t get why crate training would help your new puppy. At first glance, crate training (to most people) appears to extremely uncomfortable, and a bit like putting your new pup in puppy jail. Crates are so small, there’s not much space for our pups to move around. They can’t walk in there. So, why would it be comfortable for them? We sure wouldn’t be comfortable sleeping in a confined area. Here’s the thing… there’s magic to the crate. That’s why it’s comfortable to our little pups. What’s the magic? Dogs, by instinct, search for cozy spaces to become their ‘den.’ Their dens are their safe spot; their place to escape the world. Their crate is an area that’s 100% their own. Your puppy doesn’t look at the crate and automatically think, “yes, this is my spot.” Usually, they choose their own. Instead, we have picked her den for her. At first glance, your puppy (or dog) might be a little afraid of the crate. Don’t panic. This reaction is completely normal. After your pup becomes accustomed to the crate, he will love his new, cozy sleeping space. Of course, crate training isn’t a requirement for being a loving, responsible pet parent. But, it’s worth considering. In addition to helping with potty training, crate training can help reduce separation anxiety. And, if your dog encounters a stressful situation, the crate allows her to escape to her own world which assists in preventing severe behavioral issues. Being certain to connect the crate to a positive ‘thing’ or experience is important. If your pup connects the crate with a treat, praise, and/or a toy, he will be more likely to want to go into the crate on his own. Ensuring the connection is positive also increases the level of trust they have with you. They form a good emotional connection from this experience. To make this experience positive, don’t immediately jump into locking your pup in her crate. Be sure he is properly (and slowly) introduced to the crate first. Keep the crate open and put your pup’s favorite treat as far back in the crate as it will go. Keep the crate door open to begin. This part is important and must be emphasized. After a few attempts, if your puppy appears to be comfortable walking in the crate on her own, you can now close the door. Only close the door for as long as it takes her to finish eating her treat (or chewing on her toy). Then, open the crate back up. Gradually increase the amount of time your dog is in the crate. Leave the door closed for longer and longer periods… increasing only by a few minutes at a time. What if my Dog is Still Uncomfortable? What if the above step gets your pup somewhat comfortable… but she’s still not fully comfortable yet? Some dogs are perfectly content, and happy, with their crate using the above step. Others need more reassurance. If your dog is one who isn’t comfortable yet, we move on to desensitizing your puppy. This process could take an additional few days, or another few weeks. Continue the process above, but only keep the crate locked for 10 seconds at a time or so. Then, gradually increase only be 5-10 seconds each time and work your way up to minutes. Do not leave your puppy in the crate alone until he’s fully comfortable. We don’t want him to be miserable in there. We want him to be comfortable and feel safe. How Big Should the Crate Be? This is one of the parts of the puzzle where dog lovers get frustrated. How big should the crate be? How do you know if it’s big enough? And, how do you know it’s not too small? Your puppy (or dog) should be able to lie down, move around a bit to get comfortable, and turn around. The crate should not be big enough to have a ton of extra room. Dogs don’t like to use the potty where they sleep (by instinct). If the crate is big enough to have ‘walking room’ or an extra little area that’s not taken up by anything, she is likely to use the potty in the crate. We don’t want that to happen. Part of the reason we crate train is to help with potty-training, right? So, that would defeat the purpose of the crate. There are some general guidelines I would like to share with you. 1. Never leave your puppy in the crate by himself if he’s uncomfortable. 2. Always leave something for your pup to do in the crate- treat, toy, puzzle, etc. 3. Never leave your puppy in her crate longer than 2-3 hours… especially a young pup. Young puppies can’t hold their bladder. And, if they do, could end up developing a urinary tract infection. 4. Always take your puppy (or dog) potty before she goes in her crate. 5. Always exercise with your dog before he goes into his crate. The most important ‘thing’ to remember about crate training is… make sure the crate is a positive experience and be patient. Patience, you will find, is key to nearly everything you do with your dog. Remember, the way we want them to act and what their instincts tell them is completely different. Warm weather is upon and that means lots of outdoor activities. With the temperature rising it only makes sense to look for activities to keep you and your dog cool. Being a local to Jacksonville, FL – one of our favorite past times is attending summer beach trips. 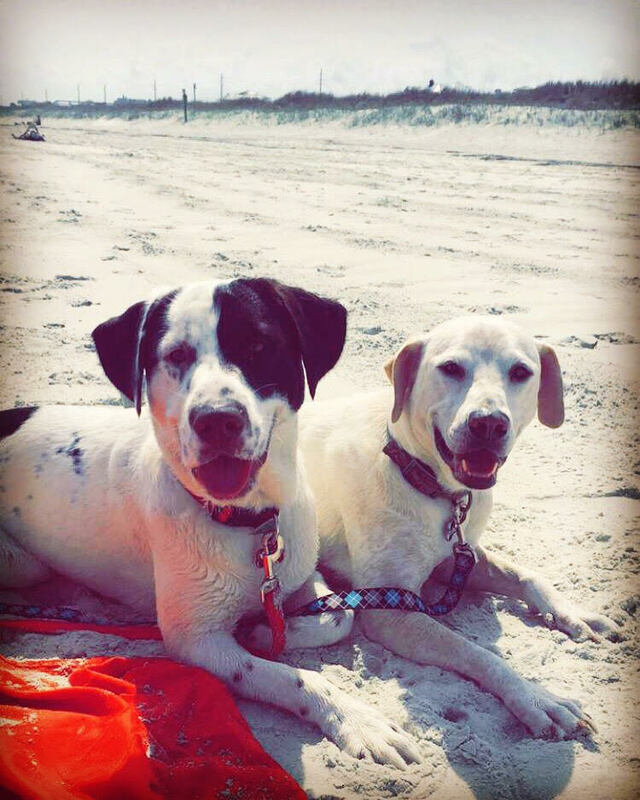 So I thought I would share a few things I keep in mind when taking my dogs to the beach! 1. Always check for dog friendly beaches. Every beach has their own set of rules when it comes to pets. Some do not allow pets at all, some do not allow pets between certain hours, and some are specifically there for your pet! It’s good to check out some reviews before planning your beach day. 2. Find a spot near the shade. With all that fur your pet can easily get over heated. So when arriving at the beach be sure to find a spot under a big tree or umbrella. While yes, the cool ocean waves will help to cool down their internal temp – it’s good for them to have a place to escape the sun. And keep in mind how hot that sand can be on their paws! 3. Water, water, and more water! Keep your pet hydrated. I would recommend making sure your pet has access to fresh drinking water 100% of the time while at the beach. Keep the water covered under your cool shaded spot so your pet can hydrate at their convenience. I usually do this by packing a gallon of fresh water and portable drinking bowls. 4. Keep your pet entertained. Pack a Frisbee, a big chew bone, or their favorite squeaky toy! I’ve come to find that when my dogs have their favorite items around they are much less likely to get into trouble by wandering over to the sand dunes, private property, or to other beach goers. With that being said – pack a leash! 5. Since you will be in a public space – be sure that your pet is current on all their vaccinations. 6. Stay close to your dog at all times. Unfortunately when going to the beach there is more to fear than the obvious, sharks. Also keep an eye out for stingrays and jelly fish… We have encountered many a jelly fish simply washed up onto shore. 7. Dog sunscreen. This is a product I wasn’t even aware of until my experience as a dog mom called for it. Naturally my Labrador retriever loves the water and the outdoors. I began to notice that the skin right above his nose, where the fur is very thin, would become bright pink after these outings. Then one day it hit me, a doggy sunburn! I felt awful that I hadn’t noticed or even considered this notion before. Ever since then I have been prepared – my favorite go to brand for dog sunscreen is Burt’s Bees. If I cannot find sunscreen specific for my dogs – I will go for the baby safe brands. 8. In the event your dog does return with a sunburn, here are a few remedies that may help. CBD dog oil, which has been known to decrease pain and ease skin irritations. Luke-arm oatmeal bath, this will help soothe the skin. 100% all natural aloe. 9. If you have a smaller pup, your pet isn’t a strong swimmer, or your pet is timid of water – it wouldn’t hurt to put them in a doggy swim vest. This will increase visibility, and better ensure the safety of your pet. With this being said, do not force your pet into the water. If anything maybe try taking the lead and see if your pet follows. 10. Time management. While we all love the relaxation a beach day can bring, I cannot deny that it’s often equally as draining. The sun takes a lot out of you, as does the loading and unloading of all your beach necessities! Keep this in mind when you have your pet at the beach with you and do not let your trip exceed more than a few hours. Take note of how your dog is acting. Some signs of heat stroke include: rapid panting, bright red tongue, thick saliva, weakness, vomiting, and diarrhea. I hope these tips were helpful! Wishing you high tides, good vibes, and wagging tails! The first few days in your home are a special, yet anxious, time for you and your new dog. Your new dog will likely be confused about where he is. He won’t immediately connect your home with his home. It’s a completely different environment than what she knows (whether she came from a shelter or a family- it’s still different). It’s up to you to ensure she has the smoothest transition possible. Before you bring your new dog home, you should determine which area of your home your dog will spend the most time. Then, dog-proof that area and place the crate somewhere comfortable (if you’re crate training). Usually, the kitchen works best. It’s easy to clean up in case of any accidents. Their knowledge of house-training may be lost during a time of great stress like this. If you plan to crate-train your dog, the crate should be set up before you bring your dog home. Don’t forget to place a mattress of some kind in the crate with them. The type of mattress you should have varies based on the breed of dog you are bringing home, and the age of the dog. Be certain to do proper research on this before bringing your new dog home. Now, dog-proofing. Dog-proofing your home is critical to keep your dog safe. Tape off any loose wires. Place household cleaners, medications, and other chemicals up high. If you have plants on the floor, do some research and see which plants dogs can and can’t be near. Finally, have their collar and leash ready to go. On the collar, there should be identification tags already attached. If your dog doesn’t already have a microchip, this may also be something to consider. The microchip isn’t a GPS device, but if your dog were to ever get lost, the microchip would be scanned and an identification code unique to your dog containing all your details would be available. The first day home could be extremely stressful or overwhelmingly exciting for your dog. Either way, give your dog time to acclimate to your home before you allow any ‘strangers’ to come over. Even if you think your dog is doing wonderful with the transition- one new event could spark stress in the first week. If you have children, show your children the appropriate way to approach a dog. When you pick up your new dog, don’t forget to ask what she ate that day (and the type of food). If you feed your new dog a completely different food, this could lead to an upset stomach and diarrhea. We don’t want that. An upset stomach could make the transition even more stressful for both him and us. If you would like to feed a different brand/type of food, do so over a one-week period adding in the new food to their old food slowly. Watch for any signs of stomach upset or loose stools. If you do notice any symptoms, lessen the amount of new food and extend the transition time. When you arrive home, immediately show your dog where the potty area is and softly say “potty-potty” or similar. Be patient during this time. Even if your dog is fully potty-trained, don’t forget there could be accidents. Your dog may not act like he has to use to the bathroom while he’s outside, then come in and immediately have an accident. Don’t panic, this is a completely normal behavior when being introduced to a new home. A routine should be put in place immediately. Structure is extremely helpful to a dog adjusting to a new home, and your resident dogs as well if they don’t already have a routine. Feeding, potty-time, and play/exercise, should have an approximate time each day. If the time changes by a half hour occasionally, that’s okay. For the first few days of your dog being home, try to be as calm and quiet as possible. Limiting excitement during this time will help her adjust. And, it will give you time to get to know your dog better. Take this time to build a foundation for the bond you will share. Training should also begin immediately. But, after the first week, you can increase the amount of physical and mental stimulation your dog is receiving. Training also helps a dog settle in further and strengthens the bond you are building. If you have a resident dog, introduce your new dog to your resident dog outside in a neutral area. If you have more than one resident dog, introduce one at a time. Don’t rush the introduction. Each dog should be on a leash, and each leash should be loose to allow the dogs to get to know one another. After the outside introduction, you can bring your new dog inside and do the in-home introduction (if all goes well outside). If you bring your new dog inside immediately without the outside introduction, this could spark a huge list of problems. Keep each interaction between your new dog and your resident dog(s) short and as pleasant as possible. If you see any sign of tension, immediately separate the dogs and try again an hour or so later. Don’t leave all the dogs alone together until you know it’s safe to do so. Watching your dogs’ body language can help you understand when it’s safe. The most important take-a-way here involves patience. Be patient with your new dog’s behaviors, training levels, and the bond you are establishing. Some dogs adjust quickly and form a bond immediately. Others take more time. Commit as much time as possible to getting to know your new dog while spending time with your resident dogs. Watch your new dog’s body language to understand what she is communicating to you and others. There’s a common misconception that dogs automatically understand how to walk on a leash. But, this is a skill that needs to be learned by your dog. Dogs are not ‘natural leash walkers.’ Fortunately, this is a simple skill to teach in most cases. The most effective way to train your dog to walk on a leash is step-by-step. Take small steps to acclimate your dog to this ‘unnatural’ behavior. You should begin this process by allowing your dog to become familiar with the collar/harness and the leash. Place the collar or harness on your dog, then clip the leash to your dog’s collar, but don’t hold onto the leash. Allow your dog to wear the collar and leash throughout the house while giving her treats. Using this step, your dog will associate the collar and leash with treats and happiness. The next step is teaching the ‘come’ command. If he already knows the ‘come’ command, that’s perfect. We’re ahead of the game. If not, this is a skill that must be taught prior to walking on a leash outside (for safety precautions). In this scenario, let’s say your dog already knows the command. Say ‘come’ and then reward your dog with a treat (with the collar and leash on). While he’s still heading your way, begin walking backwards and provide the reward (treat, kibble) when he gets to you. If you have a puppy, this process will take more patience. Puppies have very short attention spans. But remember, patience is key. At this point in the process, your dog should understand how to come to you… and feel comfortable with the leash and collar on (from Steps 1 and 2). You can now practice walking on the leash in your home. While you’re walking on the leash, reward your dog often. You may want to provide kibble in this step, so your dog doesn’t go over her treat limit. If you feed your dog too many treats, she could easily become obese. And, that leads to a range of other problems we simply don’t want. If your dog did well with steps 1-3, you can now go for a leash walk outside and test out her freshly-learned skills. Don’t get upset if your dog struggles on her first few walks outside. Even though your dog has mastered steps 1-3, you may still face challenges in this step. There will be all kinds of sounds, sights, and smells your dog may have never smelled before (especially if you have a puppy). And, if you have an adult dog, they may still smell, see, or hear things they haven’t heard before and want to explore just as much as a puppy. At first, keep the walks short. We know you want to go on long walks, but this takes time to master. If your puppy or dog becomes distracted on your walk, re-direct his attention to you and continue walking. There could be a few problems you run into. Don’t worry. Problems with leash-walking are common, and they’re generally easy to fix. The first problem… what if my dog pulls on the leash? If your dog starts pulling, you should stand completely still and refuse to move until your dog comes back to you. You should never jerk the leash, or drag your dog, as these actions could severely hurt your dog. 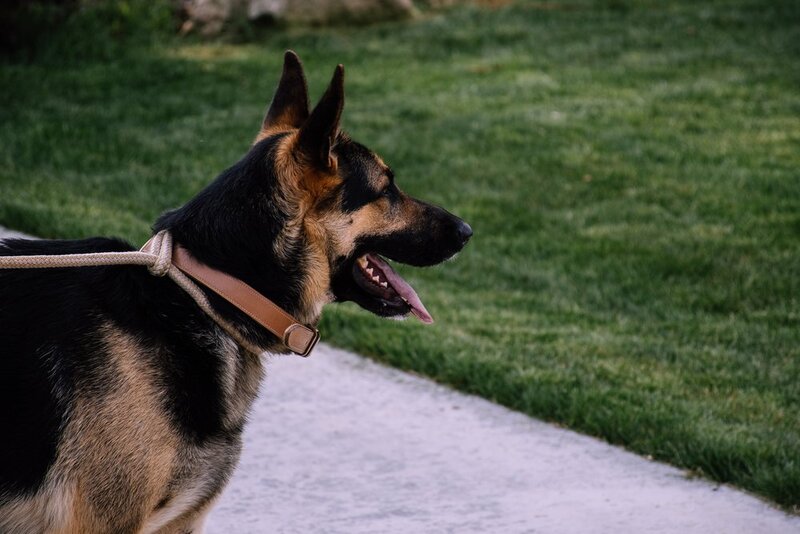 Another note to add, if your dog is a puller, a front-hook harness or head halter is recommended as these are designed for dogs who pull on the leash. The next common problem… what if she won’t stop barking? Some dogs have a barking issue when they’re going on their first walks. They aren’t sure what’s going on in the world surrounding them and may feel compelled to bark at the unknown (strangers, cats, other dogs, etc.). You can reduce this behavior by exercising with your dog before their walk. Then, there’s the constant sniffing. Dogs want to smell everything. If your dog wants to stop at every step, you might be giving them ‘too much leash.’ Retractable leashes are not recommended for this reason… especially while training. Of course, there are times when it’s okay for your dog to sniff and explore. And, as your walk with your dog, she will learn when it’s appropriate and when it’s not. The most important thing to take out of this article is… be patient and understanding. Learning how to walk on a leash is a process for your dog. And, it’s not a natural behavior. Just like going ‘potty outside’ must be learned, leash walking is a process that we desire as humans that must be learned. If you’re having a hard time getting your dog to walk on a leash properly, you should consult a Canine Behaviorist or Dog Trainer for additional tips. The best part is there are only 4 items needed to successfully make this dog bed! As prior stated, my dogs loved (past tense, woohoo!) to chew on their dog beds, so a bed made of a durable rubber tire would be just the solution I was looking for. You’ll need to wash/clean the tire with soap and an old scrub brush. Paint tends to not stick to dirt, so removing as much dirt from the treads of the tire will make all the difference when applying your spray paint! After your tire is dry, it’s time to apply your spray paint. For this item I chose, Rust-Oleum X2 Ultra Cover. Which is less than $4 at your local Wal-Mart. Be sure to select paint for outdoor/rubber items. I went with black because I figured it would be easiest, as I was still uncertain how this project was going to turn out. With this being said I have seen other DIY dog tire beds- in pinks, greens, yellows, etc. - turn out awesome. So live your life! After your paint has dried, add your felt furniture pads to the bottom of your tire all the way around. This will prevent the paint from rubbing off and transferring onto your floor. Take your old dog bed/pillow/blanket and stuff it in the center of the tire. Keep in mind, the weight of your dog may force the stuffing to the bottom of the tire or onto the floor, so the bigger and fluffier the better! I used a large plush dog bed we had on hand that unfortunately developed a large rip…. We can all guess how that happened. I faced the rip on the inside wall of the tire and no one was the wiser! Especially my pups who are now enjoying relaxing in their new, super-durable, homemade dog bed! 4 household items, and 4 easy steps is all it takes to get a durable dog bed for all your heavy chewers! Life for a dog mom on the go can get pretty rambunctious at times! Especially if you have multiple dogs. But regardless of what adventure we’re about to emBARK on- beach day, afternoon at the dog park, or an evening hike along the sunset- I have found that having these key items with me make all the difference. A must have for any dog mom, especially city moms. I once found my dog, Biscuit, rolling in a pile of dirt at the dog park. Upon further inspection I realized that he was actually rolling around in a pile of another dog’s poo... What a fun car ride home that was. From that moment on I realized the importance of cleaning up after your dog. Now I carry them with me at all times. I clip the poop bags to the outside of my backpack for easier access. You can find poop bags in bulk for relatively cheap from places like Amazon, Ross, Marshall’s, and even the Dollar Tree. No need to buy overpriced bags from pet shops. Sometimes, you just don’t quite know where the day will take you. That’s why it’s always good to be prepared, especially when it comes to hydration. I always have pop-up portable water bowls handy and ready to go! They collapse flat in my backpack as not to take up much space... oh and don’t forget the water too! Some states adhere to pretty strict leash laws. So a ‘leash’ can go without saying. But I have found that especially while leash training, harnesses seem to be much more effective by eliminating pulling and choking. This one I learned the hard way. I started to notice that our dog-outings were really taking a toll on my vehicle. Deodorizing pet wipes help to eliminate not only an excess dirt, but will also reduce that outdoor odour. This is great to have on hand if you need to bribe your dog to get in the car, or to pose for a picture. Plus, I’m sure they were a good boy/girl and definitely deserve a treat. From one dog mom to another, I hope these essentials help make your next outing a little less RUFF.